Trinity Winchester offers support to over 600 homeless and vulnerable people every year, with services open 6 days a week. The charity is dependent on donations and events to keep the services running and the money raised from the Black-Tie Dinner will be put back into running the drop-in centre for around 50 -60 clients each day. 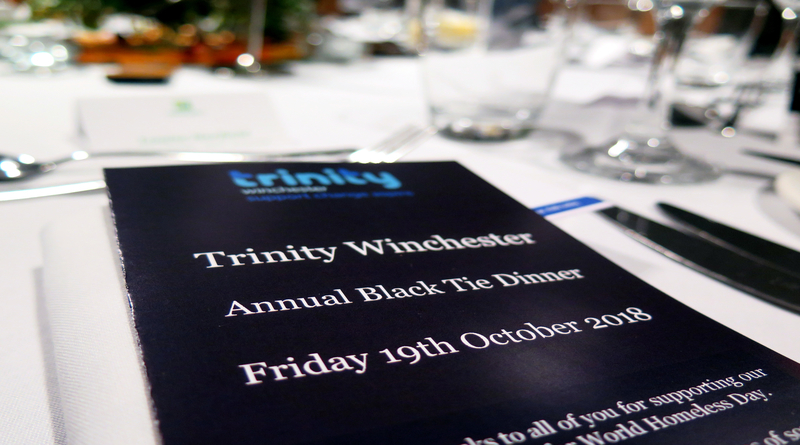 We are really delighted with the amount raised for Trinity at the Black-Tie Dinner. It was a truly special evening and we were overwhelmed by the sheer generosity from both the supporters and sponsors, they have made a huge difference to support our vital work. The main event of the evening was the live auction with prizes ranging from tickets to The British Open Golf in Royal Portrush, fly fishing on the Newton Stacey Estate and a spectacular day on a Sunseeker Portofion 53. The raffle and silent wine auction included a range of fabulous prizes and fine wines donated by supporters and local business throughout Winchester.